And then — oh, wait. Hold on. Sorry. I probably should’ve said that earlier. Oh, well. So let’s check back in with Elizabeth Collins Stoddard, for one of the Great Moments in Accidental Phone Acting. Liz: (on the phone) What do you mean, you won’t have a confirmed list until… Well, when will that be? Yes, I’ll wait. Mrs. Johnson: What do they say? Liz: They won’t have an accurate copy of the passenger list until they hear from the terminal in… in, um… oh, that place in Brazil. She stamps her foot, and pretends to be listening to the phone while she remembers her line. 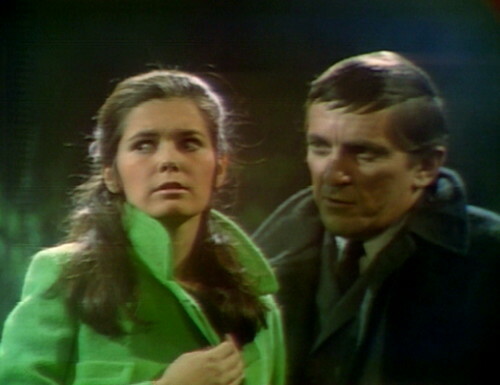 At the Old House, Barnabas is longing for the day that Julia’s experiments are completed, and he can make his advances on Vicki Winters, who will fill the role of his lost love, Josette. Now, Julia has some warm feelings of her own for Barnabas, so she doesn’t have a lot of patience for this Josette nonsense. She asks the crucial, devastating question. He gets up with a moody frown, and she follows him across the room, challenging him. Julia: Then why is Josette so important to you, when you were never very important to her? This, it turns out, is the most important question that the show needs to answer right now. Burke is dead. This is our new romantic lead. And from what we’ve heard so far, the Barnabas/Josette love story was entirely one-sided. 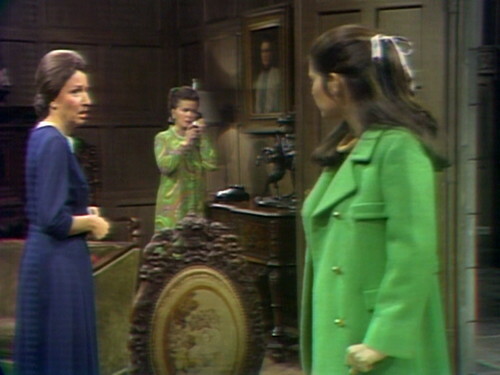 Early on in the vampire storyline, Barnabas told Vicki and Carolyn the story of Josette’s death — running through the woods, being chased by something that terrified her, and throwing herself off the cliffs at Widow’s Hill. We also know that Josette was married to Jeremiah, and by all accounts, they were happy together. And based on Barnabas’ sick obsession with creating a lobotomized Josette-substitute, there’s a very strong suggestion that Barnabas was never Josette’s lover. He was her stalker. This is a huge audience-sympathy roadblock that needs to be addressed. Meanwhile, at Collinwood, Liz gets a phone call from Brazil, confirming the earlier reports. Burke was on the plane that crashed in the jungle. He’s dead. And that death — off-screen, apparently a random accident, not connected to any other character or story point — is incredibly insulting to the character, and to anyone in the audience who cares about him. The legendary soap writer Agnes Nixon said that the soap opera motto is: “Make ’em laugh, make ’em cry, make ’em wait.” The sequence that just happened — the first report of a possible crash, getting confirmation, breaking the news to the fiancee — should take, at absolute minimum, a week. By all the rules of soap writing, just the question Was Burke on that plane? should be a strong enough plot point to sustain audience interest for days. 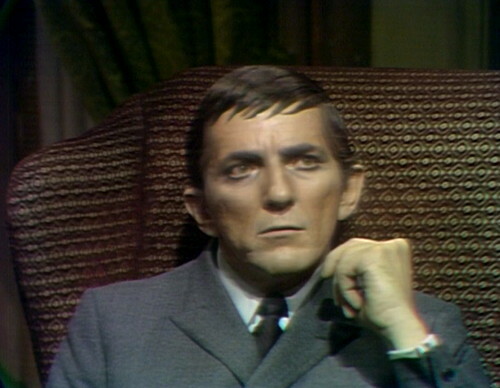 But Dark Shadows answers the question halfway through the episode. They don’t even trust that the audience will stay interested beyond a couple of commercial breaks. Basically, they’re clearing the decks for the Barnabas/Vicki/Julia love triangle. Burke was just getting in the way — blocking any Barnabas/Vicki movement, but not producing any new story possibilties. Narratively, he was dead weight, so they cut him loose. And the audience — who can sense this kind of thing automatically, even if we’re not aware of it — is perfectly happy to let him go. He’s not only merely dead; he’s really, most sincerely dead. This brings us back to Barnabas, who leads Julia to the cliff on Widow’s Hill, where Josette jumped to her death. Let the retcon commence. Barnabas: I still remember the first time I saw her. It was a gray, cloudy day, and we had all gathered at my father’s house to welcome the new Collins bride. I was not particularly anxious to be there. I had other things to do, more important things, I thought, than to welcome my middle-aged uncle’s new wife. 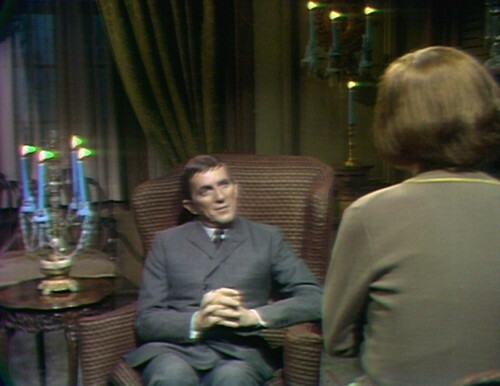 Barnabas: I had to live with it for a long time, and then… I knew suddenly how I could win her. Barnabas: She was young when she married him, and he was middle-aged. But as the years passed, she began to see that she was married to an old man. She felt as if life had been stolen from her. She began to fear time, and I knew that only I could defeat time for her. 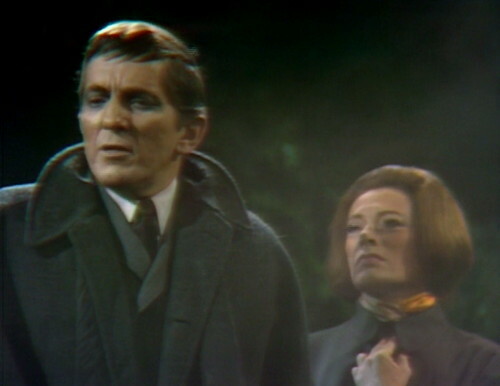 Barnabas: Then she would be mine, forever. And she would have been… if she hadn’t been foolish, and frightened. So, that’s a start. They’re finally starting to flesh out that story, and now there’s a suggestion that Josette might have returned his affection. But there’s more work to do. 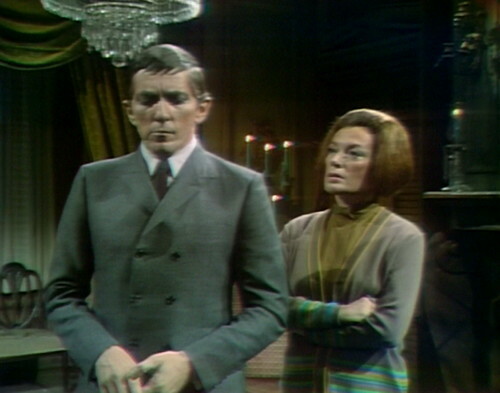 The Barnabas/Josette story is going to power the next twelve months of Dark Shadows storytelling, and this version isn’t strong enough yet. We’ll see a brand new, updated version in a few weeks, and it’s completely different from what Barnabas tells us here. This episode takes the show two steps forward — closing the door on Burke’s narrative dead end, and continuing to rebrand Barnabas in a more sympathetic position. The Barnabas reboot isn’t quite ready yet… but it will be, very soon. Liz’s flub early in the episode about “that place in Brazil” is really worth seeing. This episode begins a record-setting run of episodes for Grayson Hall (Julia). She appears in 21 straight episodes, from 345 to 365. That says a lot about how important her character has become — they can’t make an episode without her. So far, nobody else has even come close to this — the closest is Alexandra Moltke (Vicki), who appears in 14 straight episodes between July and August. Great way of addressing the utter ridiculous way DS offed Burke. It was completely devoid of drama and meaning, beyond, as you note, clearing the decks for Barnabas and Josette Robot 2.0. At least let the guy fall off Widow’s Hill or something and let his ghost haunt somebody. But then Burke would have been interesting then. Ha, Josette Robot 2.0. That’s a perfect description. It’s actually a bit baffling that we don’t really know what Barnabas’ awesome v2 plan is. He just says “it’ll be different, she’ll come willingly.” He has no idea what he’s doing. Also, speaking of Burke coming back as a ghost — that’s exactly what happens to Anthony George’s next character. They loved killing that dude. Mitch Ryan was Burke. Anthony George took all the danger out the character. He just became boring. Mitch would have been a good Jeremiah. Too bad DC fired him. Well, Mitch showed up to shoot episode 252 too drunk to work, and they had to replace him with Joe. But yeah, I agree. A drunk Mitch Ryan is better than a stone-cold sober Anthony George. Brilliant. I agree Burke deserved a way more dynamic send-off. I know the character had severely lessened in importance, especially once Anthony George took over (who I did not like in the role – though I thought he was good as Jeremiah) but still, he was a major character and was still getting second billing after Joan Bennett. Oh well, I’m thinking they had him “die offscreen” just in case they ever decided to bring him back, which of course never happened. As an aside, remember how Mrs. Johnson was planted in Collinwood by Burke to find out the identity of Bill Malloy’s killer? I always wondered if he was still paying her? Was she still spying for him? Did he leave anything for her in his will? These things keep me up at night. Just imagine Mitch in 1795’s duel with Barnabas. Totally different dynamic. AG was just to wimpy. Sorry to bag on him. As a kid I loved AG but now I know Mitch was just the better actor for the part. Pedro, about Mrs. Johnson: I suppose there’s always the possibility of a “Secret History of Collinwood” conspiracy theory where she continued to send detailed reports of the Collins family to Burke, who faked his death to get out of marrying Vicki. That’s why Mrs. Johnson was the first to hear about the “crash” — they never would’ve mentioned a plane crash in Brazil on the radio. Oh my God this totally makes sense. Works for me! Actually, when I first saw these episodes – and not knowing what was to come – I honestly thought Burke was not dead and he would return, marry Vicky, and that’s how she would leave the show. Boy, was I wrong. Danny, one of the many things I love about your site is your utter loathing for Vicki. Cracks me up every time. I suppose Burke could be alive still. If he would of come back Barnabas should have walled him up next to the good Reverend. 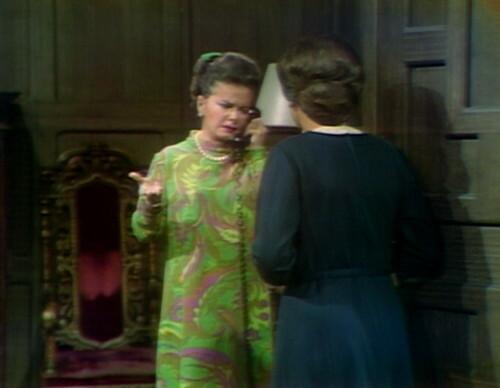 Bless you…Joan Bennett’s “Belem” is one of my favorite moments in “Dark Shadows” or any television show! Yeah, I can’t do it justice in prose. It needs to be seen. Just watched Joan spit out “Belem” — maybe she thought they were going to do a Take #2 — didn’t you say DS usually gave her favor with editing due to her Hollywood movie star status. P.S. Love the blog — it’s totally addicting. I agree – it makes no sense why they would leave the copyright date showing incorrectly as 1966 for most of the year and then suddenly correct it to 1967 in October. Probably nobody on the production staff thought anything about it at the time, but for those of us still enjoying the show almost 50 years later, we have nearly a year of mislabled episodes. It’s kind of misleading. Anyone here listen to the Dark Shadows audio dramas from Big Finish? The latest one features the return of Mitch himself, revealing to Maggie exactly what did happen to Burke Devlin in Brazil. Unmissable stuff. I don’t blame Barnabas for being hot for Vicki, I am as well, even with her spaced personality it was 1967 after all . We all asked for it and now that we have it, as we always do, we want to complain about it. Happy Burke’s gone just surprised they didn’t drag it out further. On 2nd thought happier still they didn’t drag it out further because that would mean Vicki whining ad nauseum. 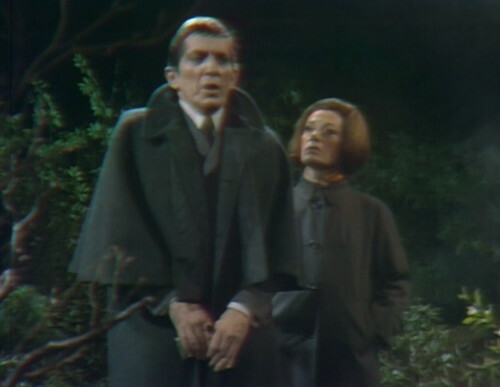 Btw, it was hilarious how Barnabas dismissed the old ball and chain so he could get some alone time with the newest grieving widow. Poor Julia, I guess that was payback for the little comment about Josette. That shot of Grayson staring at Jonathan while telling the Josette story shows her acting chops. BTW, love The Wizard of Oz reference. It’s always good to reference Oz! Oops! I’m very sorry about the double posting; didn’t mean to do that. Got so caught up in having fun here on this blog I wasn’t paying close enough attention. Again, my sincere apologies.